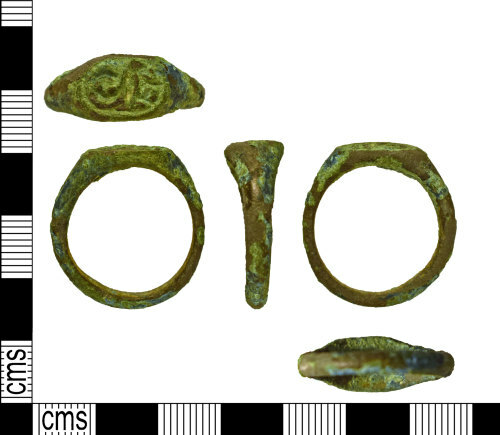 A complete copper alloy 'signet' Finger Ring of Late Medieval to Post-Medieval date (AD 1400-1600). The object has an incised / engraved seal matrix bezel. The ring is an irregular D shape - often called stirrup-like in plan and the hoop has an angular D shaped cross section. The hoop expands toward the front and the shoulders of the ring have distinct angular expanded facets. The bezel is formed on a horizontal platform into which the design is incised. The bezel is rectangular with rounded edges and is edged by a deeply cut ovate linear border. The central image is deeply cut and is composed of two initials "GE". The inner surface of the ring is undecorated. Length: 26.19mm, Width: 24.02mm, Thickness: 3.10mm, Weight: 6.0g. The metal is dark green in colour with areas of light green corrosion and a heavily pitted patina. This form of finger ring is well known from the later medieval and early post medieval periods and a number are published in the Salisbury Medieval Catalogue (Cherry, 1991; 42 and 46 specifically cat no's 17-18 ) which are dated to the 15th century.